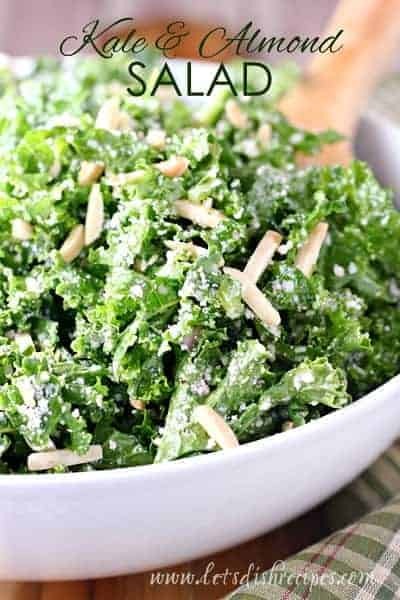 KALE AND ALMOND SALAD WITH LEMON AND PARMESAN — Fresh kale is tossed with almonds and Parmesan cheese in a tangy lemon vinaigrette. There has been an abundance of kale at my farmers’ market the last few weeks, so I decided to bring home a bunch and see what I could do. 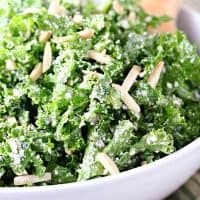 I never suspected that this Kale and Almond Salad with Lemon and Parmesan would become one of my family’s all-time favorite salads! There’s a reason kale has become so popular lately. 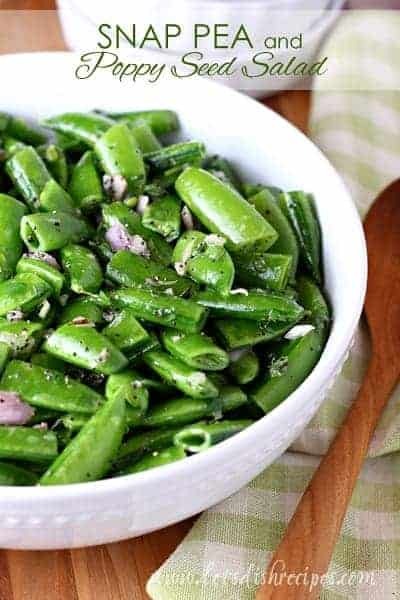 It’s a great source of calcium, potassium, iron, and vitamins A, C and K.
And to think, 20 years ago, when I was in college and worked as a waitress, the only thing we used kale for was to garnish the salad bar. My family doesn’t normally get very excited about kale, so I’ve been hesitant to bring any home. But May has been unseasonably wet and cool here in Colorado, which means we haven’t seen as much variety at the farmers’ market. 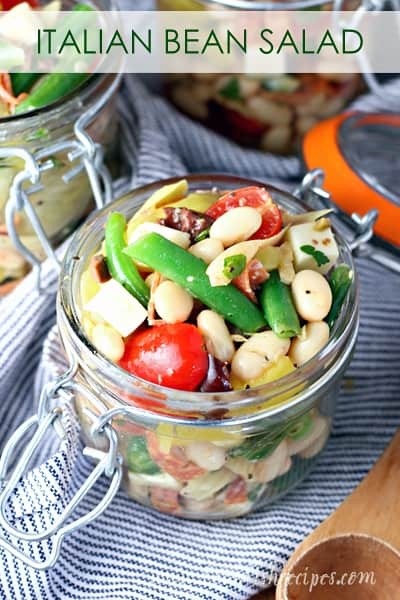 I can’t tell you how surprised I was at how much my family–myself included–loved this salad! Shocked, really. Everyone went back for seconds and my 9 year-old at four servings! We were having macaroni and cheese for dinner, but he just kept eating the salad and asking for more. With the great reaction I got, I can see myself serving this several times a week. If anything, it’s proof that sometimes just a few fresh, simple ingredients are all you need to create an amazing dish. 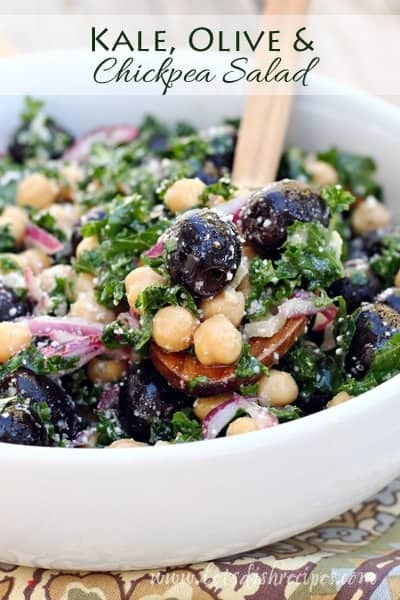 If you’ve got a bunch of kale and you don’t know what to do with it, I highly recommend this salad! 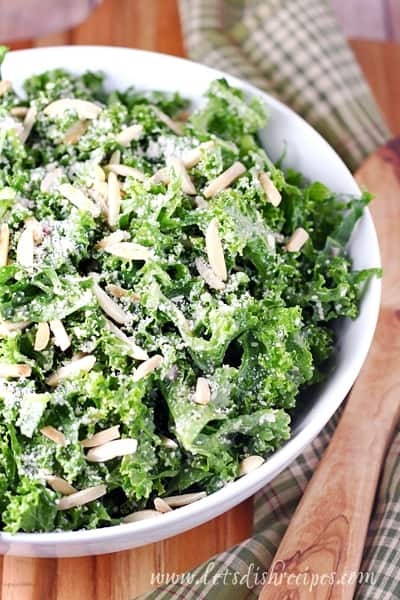 Be sure to save this Kale and Almond Salad with Lemon and Parmesan recipe to your favorite Pinterest board for later. Fresh kale is tossed with almonds and Parmesan cheese in a tangy lemon vinaigrette. Wash and dry kale and chop or slice into bite-size pieces. In a large bowl, toss kale with toasted almonds. Set aside. In a small bowl, whisk together minced shallot, lemon juice, vinegar, and olive oil. Toss kale with desired amount of lemon vinaigrette. Sprinkle with Parmesan cheese and toss to coat. Season with salt and pepper to taste before serving. Who Dished It Up First: Adapted from Heather Christo. I LOVE kale! I can’t wait to try this one, Danelle! I was in the supermarket this arvo when I noticed the kale. I remembered your recipe for a kale salad so I thought I’d give it a go. WOW…..it’s good. I’ve never even thought about kale before but now it will be a regular. Thanks so much Danelle for livening up our diet.